Sadly, due to vandalism King George’s Park is now without baby swings and a climbing frame. Can anyone help to speed up getting this fabulous space fixed please? Our children deserve better than this. Have spoken to our Borough Environment Team just two weeks ago to effect a repair to the very old climbing frame and the swings, both damaged due to vandalism. As I write replacement parts for the frame MAY be difficult to obtain but our excellent Team will endeavour to source. On a brighter note look out shortly for the consultation regarding new proposed facilities in the Park hoped for next year. 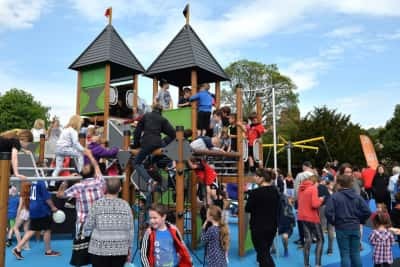 I have received a further update, telling me that both the seesaw and the Climbing Frame have both been vandalised and had to be removed for safety reasons, underlining the good news that a Consultation on new sites and equipment on our lovely Village Park is now due very shortly.